Astronomers have been listening to radio waves from space for decades. In addition to being a proven means of studying stars, galaxies, quasars and other celestial objects, radio astronomy is one of the main ways in which scientists have searched for signs of extra-terrestrial intelligence (ETI). And while nothing definitive has been found to date, there have been a number of incidents that have raised hopes of finding an “alien signal”. In the most recent case, scientists from the Arecido Observatory recently announced the detection of a strange radio signal coming from Ross 128 – a red dwarf star system located just 11 light-years from Earth. As always, this has fueled speculation that the signal could be evidence of an extra-terrestrial civilization, while the scientific community has urged the public not to get their hopes up. The discovery was part of a campaign being conducted by Abel Méndez – the director of the Planetary Habitability Laboratory (PHL) in Peurto Rico – and Jorge Zuluaga of the Faculty of Exact and Natural Sciences at the University of Antioquia, Colombia. Inspired by the recent discoveries around Proxima Centauri and TRAPPIST-1, the GJ 436 campaign relied on data from Arecibo Observatory to look for signs of exoplanets around nearby red dwarf stars. After first noticing this signal on Saturday, May 13th at 8:53 p.m., scientists from the Arecibo Observatory and astronomers from the Search for Extra-Terrestrial Intelligence (SETI) Institute teamed up to conduct a follow-up study of the star. This was performed on Sunday, July 16th, using SETI’s Allen Telescope Array and the National Radio Astronomy Observatory‘s (NRAO) Green Bank Telescope. They also conducted observations of Barnard’s star on that same day to see if they could note similar behavior coming from this star system. This was done in collaboration with the Red Dots project, a European Southern Observatory (ESO) campaign that is also committed to finding exoplanets around red dwarf stars. This program is the successor to the ESO’s Pale Red Dot campaign, which was responsible for discovering Proxima b last summer. As of Monday night (July 17th), Méndez updated his PHL blog post to announced that with the help of SETI Berkeley with the Green Bank Telescope, that they had successfully observed Ross 128 for the second time. The data from these observatories is currently being collected and processed, and the results are expected to be announced by the end of the week. Unfortunately, each of these possibilities have their own drawbacks. In the case of a Type II solar flare, these are known to occur at much lower frequencies, and the dispersion of this signal appears to be inconsistent with this kind of activity. In the case of it possibly coming from another object, no objects (planets or satellites) have been detected within Ross 128’s field of view to date, thus making this unlikely as well. And just to be fair, Méndez also addressed the possibility that the signal could be artificial in nature – i.e. evidence of an alien civilization. “In case you are wondering,” he wrote, “the recurrent aliens hypothesis is at the bottom of many other better explanations.” Sorry, alien-hunters. Like the rest of us, you’ll just have to wait and see what can be made of this signal. When Comet 209P/LINEAR — the comet that brought us the Camelopardalids meteor shower last weekend – was first discovered in February of 2004, astronomers initially thought it was an asteroid. However, subsequent images of the objects showed it had a tail, and so it was reclassified as a comet. Now, new images taken by the Arecibo Observatory planetary radar system reveal Comet 209P/LINEAR has complex surface features that will require more analysis to fully interpret. This mini world seems to be filled with ridges and cliffs along with its icy surface. “This is the highest resolution radar image we have obtained of a comet nucleus,” said Dr. Ellen Howell from the Universities Space Research Association, who led the observations of the comet at Arecibo, located in Puerto Rico. The Arecibo Observatory is taking advantage of the approaching close pass of Earth by Comet 209P/LINEAR, taking these new radar images which confirm this comet to be about 2.4 by 3 km kilometers (1.5 x 1.8 miles) in size and elongated in shape. Earlier optical observations suggested this size range, but now these radar observations are the first direct measurement of the nucleus dimensions. Comets very rarely come this close to Earth, but don’t worry: Comet 209P/LINEAR is not coming close enough to cause any problems or concerns. But this relatively close pass makes this an extraordinary opportunity to get images of the surface. As Dr. Howell noted, these observations of are some of the most detailed. Just six comet nuclei have been imaged by spacecraft, and a wide variety of surface features and structures have been observed on these icy objects. Comets have a central nucleus made of ice, dust, and rocks, and a coma of dust and gas. Two tails, one made of ions and one of dust, form in the direction pointing away from the sun. Other comets seen by Arecibo radar include 103P/Hartley 2 and 8P/Tuttle, and 73P/Schwassmann-Wachmann 3. Unlike long period comets Hale-Bopp and the late Comet ISON that swing around the Sun once every few thousand years or few million years, Comet 209P/LINEAR visits our neighborhood frequently, coming ‘round every 5.09 years. However, it will not be close enough to Earth again for radar imaging any time in the next 100 years. With a rotation period of approximately 11 hours as determined by Carl Hergenrother at the University of Arizona using the 1.8 meter VATT telescope, this comet is one of the many Jupiter family comets, which orbit the Sun twice for every time Jupiter orbits once. It was discovered by the Lincoln Laboratory Near-Earth Asteroid Research (LINEAR) automated sky survey. The Arecibo Observatory, located in Puerto Rico, is home to the world’s largest and most sensitive single-dish radio telescope at 305 meters (1000feet) across. This facility dedicates hundreds of hours a year of its telescope time to improving our knowledge of near-Earth asteroids and comets. Dr. Howell specializes in studying comets and asteroids using radar, as well as passive radio and infrared spectroscopy techniques to determine the surface and coma properties of small solar system bodies. She was assisted in these observations of Comet 209P/LINEAR by Michael Nolan, Patrick Taylor, Alessondra Springmann, Linda Ford, and Luisa Zambrano. Arecibo Observatory, and the complementary Goldstone Solar System Radar in California run by NASA’s Jet Propulsion Laboratory, are both observing comet 209P/LINEAR during its pass by Earth in May. These radar facilities are unique among telescopes on Earth for their ability to resolve features on comets and asteroids, while most optical telescopes on the ground would see these cosmic neighbors simply as unresolved points of light. For more images and information on Comet 209P/LINEAR, see the Arecibo Observatory’s planetary radar page. The Arecibo Observatory is operated by SRI International under a cooperative agreement with the National Science Foundation, and in alliance with the Sistema Universitario Ana G. Méndez-Universidad Metropolitana and the Universities Space Research Association. The Arecibo Planetary Radar program is supported by NASA’s Near Earth Object Observation program. Damage to the iconic Arecibo Observatory from an earthquake earlier this year has been repaired and the telescope is now back to full service. On January 13, 2014, the William E. Gordon radio telescope sustained damage following a 6.4 magnitude earthquake that was centered 37 miles northwest of Arecibo. A large cable that supports the telescope’s receiver platform had “serious damage,” according to Bob Kerr, the Director of the Arecibo Observatory. The platform hangs above the Arecibo dish, supported by cables. Via Cornell University. The cable that was damaged was one of 18 cables that supports the 900-ton focal platform of the telescope. This particular cable was actually a known potential problem, Kerr told Universe Today in a previous interview. He said that during original construction of the telescope in 1962, one of the original platform suspension cables that was delivered to the observatory was too short, and another short cable section was “spliced” to provide sufficient reach to the platform. “You might say that our structural Achilles heel was exposed,” Kerr added. Inspectors from New York’s Ammann & Whitney Bridge Construction, who have been inspecting the Arecibo observatory site since 1972, were brought in to access the situation and Kerr said a relatively low-cost (less than $100,000) repair option was designed and carried out, bringing the telescope back into full service as of March 13, exactly two months from when the earthquake occurred. The Arecibo Observatory is operated by SRI International, teaming with Universidad Metropolitana and the Universities Space Research Association, in a cooperative agreement with the National Science Foundation. 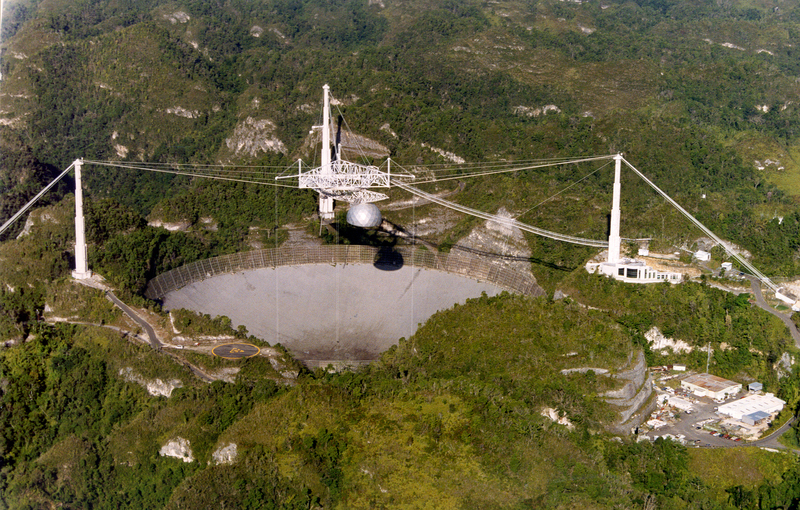 The Arecibo Observatory’s 305 meter (1,000 ft) radio telescope is undergoing emergency repair after being damaged during a 6.4 magnitude earthquake on January 13, 2014. A large cable that supports the telescope’s receiver platform had “serious damage,” according to Bob Kerr, the Director of the Arecibo Observatory. The earthquake’s epicenter was located in the ocean about 60 kilometers (37 miles) northwest of Arecibo and was one of the largest to hit Puerto Rico in several years. The quake caused some floor cracking in buildings and homes on the island, as well as power outages, but no major damages or injuries, officials said. There were, however, at least 70 aftershocks with at least three of a magnitude 3.5 or greater. 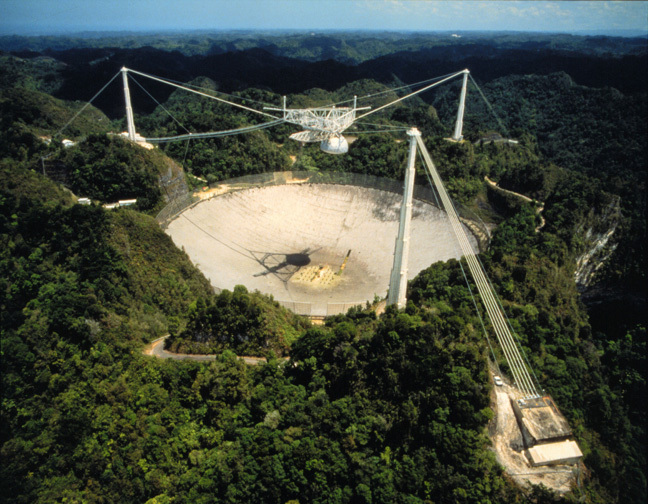 The famous radio observatory is located near Puerto Rico’s north coast, and opened in 1963. It was built inside a depression left by a sinkhole and is the largest curved focusing dish on Earth. The dish’s surface is made of thousands of perforated aluminum panels, each about 1 by 2 meters (3 by 6 feet), supported by a mesh of steel cables. The receiver is on a 900-ton platform suspended 137 meters (450 feet) above the dish by 18 cables running from three reinforced concrete towers. It was one of these 18 cables that was damaged, and this particular cable was actually a known potential problem. Kerr said that during original construction of the telescope in 1962, one of the original platform suspension cables that was delivered to the observatory was too short, and another short cable section was “spliced” to provide sufficient reach to the platform. Inspectors from New York’s Ammann & Whitney Bridge Construction, who have been inspecting the Arecibo observatory site since 1972, were brought in to access the situation. Kerr said a relatively low-cost (less than $100,000) repair option was designed, and materials are now being procured to complete a repair that is expected to bring the telescope back into full service. This repair is considered temporary, however, and Kerr said a more comprehensive long-term cable repair design is being developed. But the repair to the cable is by no means easy. The Arecibo Observatory maintenance staff will be doing the repairs themselves, working high above the ground on the 900-ton steel suspension bridge-like suspension system. In the meantime, the telescope is being used only sparingly and with an “abundance of caution,” using only limited motion of the telescope. Kerr said that despite the damage, the telescope was able to continue its science mission by participation in a ten-day global ionospheric study in late January, in addition to continuing a search for pulsars in the sky above Arecibo, and searching for fast radio bursts (FRBs). Because radio telescopes can work at all times of day and in all kinds of weather, the observatory normally operates 24 hours a day. The Angel Ramos Visitor Center at the Observatory was closed for a few days, but reopened on January 22, with normal access and visiting hours. The Observatory is recognized as one of the most important national centers for research in radio astronomy, planetary radar and terrestrial aeronomy. During its 50-plus years of use, findings from Arecibo have contributed to better understanding of the Earth’s atmosphere, the Moon, asteroids, other planets, exotic stars, our galaxy, and the large-scale galactic structure of the universe. The facility was featured in the movies “Contact” and “Golden Eye,” as well as dozens or TV shows and books, and is one of the most popular tourist attractions in Puerto Rico. It is operated by SRI International, teaming with The Universidad Metropolitana and the Universities Space Research Association, in cooperative agreement with the National Science Foundation. You can get more information about the Arecibo Observatory here, and here, or at the observatory’s Facebook page. The mighty Arecibo Radio Observatory is one of the most powerful radio telescopes ever built – it’s certainly the larger single aperture radio telescope on Earth, nestled into a natural sinkhole in Puerto Rico. We’re celebrating the 50th anniversary of the construction of the observatory with a special episode of Astronomy Cast. “The Arecibo Observatory” on the Astronomy Cast website, with shownotes and transcript.